Growth Hacking: The Results Are In. Kind Of. Wah, what happened? How is it July, and not even early July but mid July? How have I not posted in so long? Well, here’s the truth: I’ve been posting every week, but the damn zombie post has been eating them. Because they were smart posts, and thus full of brains. Unfortunately for a data-driven marketer, I can only bring anecdata to the table, and the reason why illustrates the difficulties of testing things without true split conditions. I quieted down on the blog for a couple of weeks, unlinked the blog from the LinkedIn profile, and generally tried to control things so that changes in views and incoming requests could be attributed to the title change and nothing else. But at the same time, I had been working on a piece on the KISSMetrics blog about landing page optimization, which was a great opportunity, and one that I didn’t have that much control over. They ran the piece when they ran the piece, and I couldn’t really say, “Hey, could you hold off for six weeks? I’m doing an experiment.” So the piece ran right around the same time I Growth Hacked my job title. So– yes, I did get a lot of traffic to my profile, and I did get a lot of inbound requests from people wanting hacking. But did it come from the title change? Did it come from the KISSMetrics piece? Did it come from putting my Lean slides on SlideShare, which also produced traffic? It’s hard to say. My gut– which even a data-driven marketer has– says that yes, the title change did produce some traffic and some inbound opportunities. I admit, this is not a resounding answer. Now if you’ll excuse me, I’m off to carefully cull Andrew Chen’s posts and Twitter so I can get ahead of the curve on the next buzzword opportunity. 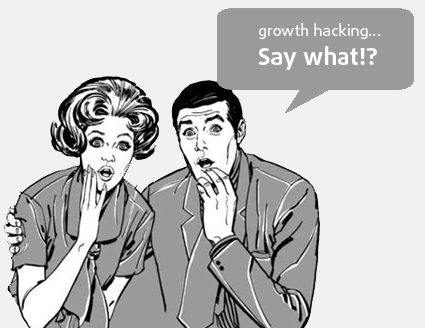 Growth Hacking: Does It Bring All The Boys To The Yard? Growth hackers are a hybrid of marketer and coder, one who looks at the traditional question of “How do I get customers for my product?” and answers with A/B tests, landing pages, viral factor, email deliverability, and Open Graph. On top of this, they layer the discipline of direct marketing, with its emphasis on quantitative measurement, scenario modeling via spreadsheets, and a lot of database queries. Huh, I thought when I read that. That just sounds like the sort of smart, scrappy marketing every startup should be doing. But whatevs, I guess if we need a new title to take its place alongside “Social Media Guru” (15,157 results on LinkedIn) and “Viral Ninja” (312 results, a growth opportunity! Although sounding somewhat like an aggressive case of Japanese encephalitis), then “Growth Hacker” works fine. Cut to today; I was chatting with another marketing nerd and he mentioned that after he finally broke down and put the term “Growth Hacker” on his LinkedIn profile, the opportunities came pouring in like gravy at a Southern buffet. Okay, I thought, I’ll do it. BUT I’LL ONLY DO IT FOR SCIENCE. I realized this is an exciting chance to– say it with me– test! I’m going to change my title and see how it affects how many people look at my profile. This is a good example of the kind of experiment that can’t really be tackled with a split test. That means I have to try to control what other factors I can. And pretty much the only factor I can control is that for the last month I’ve been running all my blog posts through LinkedIn, as well as participating in some groups there. So I disconnected my LinkedIn from the blog and– I’m sorry to do this to you, Lean Startup Group– I’ll also refrain from commenting in groups. I’ll let the control conditions stand for a couple of weeks, and then I’ll change the title. And then I’ll sit back with a napkin around my neck and a piece of white bread in each hand, waiting to sop up that sweet, sweet gravy. It’s exciting, I know. Try sleep well at night, regardless. I will keep all The World apprised of results. Enter your email address to subscribe to this blog and receive notifications of new posts by email. You know you must have.